This is a whole of life policy which provides a guaranteed sum assured. The product is available to anyone between the ages of 50 and 85. 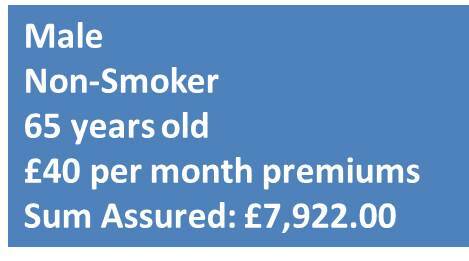 The sum assured depends on the monthly premium selected, up to a maximum of £15,000 sum assured and £50.00 monthly premium. As a whole of life policy the term does not expire. However, should you reach age 90 you will not have to pay any further premiums and your cover will remain active. The policy requires no medical underwriting therefore it is quick and easy to set up. If you have previous medical conditions and are concerned that you would not pass a medical, or would prefer not to disclose your medical history, then this product is perfect for you. However, if you are a healthy individual we recommend you speak to a financial adviser regarding the alternative products that are also available. The over 50’s plan can be used to ensure your loved ones are not impacted financially by rising funeral costs or simply to provide a lump sum for their benefit. EFPG can offer protection products from a number of partners and we would advise upon the most suitable provider according to your circumstances. If EFPG were to consider AIG to be the most suitable provider, you would benefit from AIG’s partnership with Best Doctors and Winston’s Wish.